(Host) Everyone agrees that Lake Champlain has too much phosphorus pollution. And there’s strong consensus that despite decades of work and millions of dollars spent, the lake is showing little improvement. In the second of two parts, VPR’s John Dillon explores some of what’s being done to try to clean up the big lake. (Dillon) Phosphorus is the main problem. 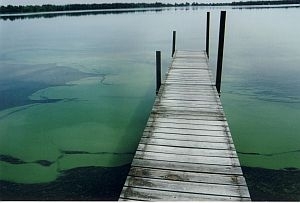 It’s a nutrient that acts as fertilizer for the toxic algae blooms that choke the northern bays. Vermont’s environmental agency is focused on stopping the non-point phosphorus pollution pouring into Lake Champlain. It’s in the stormwater that runs off thousands of city streets, or it’s contained in the manure washing from farm fields. Research this summer is aimed at pinpointing these pollution sources. Julie Moore directs the state’s clean and clear program. She says the state will use sophisticated mapping and aerial photography to identify phosphorus hot spots. One technique uses laser-based imaging technology called LIDAR that can detect changes in elevation as small as six inches. (Dillon) The new images get much, much closer. (Dillon) This research – coupled with more traditional aerial photography – should identify unknown and uncontrolled phosphorus sources. But officials already know where a lot of phosphorus comes from – and that’s from farm operations. So the state is helping to design systems for farms to better management manure and milk house waste. Often these involve containing the waste in large pits for use later as fertilizer. (Dillon) But the state hasn’t made much headway on the non-point front. The Agency of Natural Resources is years late in cleaning up Chittenden County streams eroded and polluted by urban run-off. The damage happens when water rushes off paved streets and parking lots and gouges out the stream channel, sending more phosphorus-laden sediment downstream. Moore says a state stormwater scientist is working this summer with the city of St. Albans to control urban run off. These systems usually involve retention ponds that trap and then slowly release the dirty water over time. The state is looking for grants and hopes to start work next year. (Dillon) But there’s another phosphorus source that the state is not doing much about – and that’s the stuff that comes straight from sewage treatment plants. The state says just 10 percent of the phosphorus coming into the lake comes from sewage. So officials want to focus on the non point sources. But environmentalists question the state’s focus – and its numbers. Mike Rapacz is a science consultant working for the Conservation Law Foundation, a regional environmental group. (Dillon) Rapacz uses a small motor boat to offer a guided tour of the lake’s dirty water. Near the mouth of the Winooski River, the lake is brown and visibility in the water is down to a couple feet. Rapacz says no one knows how much phosphorus comes from sewage plants – because they routinely release raw sewage during storms or spills. (Dillon) The state reports show almost daily spills or overflows as the plants were overwhelmed by heavy rain. For example, on July 18, the St. Albans sewer plant twice dumped untreated sewage into a stream. Two days later, Vergennes released untreated sewage, followed later in July by the towns of Middlebury and Proctor. Christine Thompson directs the wastewater management section for the Agency of Natural Resources. She says the basic solution is to separate storm drains from sanitary sewers so the rain doesn’t overpower the system. (Dillon) The state recently ordered one chronic polluter to clean up its act. The town of Proctor is under orders to fix its system by September of this year. For VPR News, I’m John Dillon. VPR’s John Dillon takes a look at the science and solutions to pollution in Lake Champlain in this special two-part report. Governor Jim Douglas had promised a cleaner lake to celebrate next year’s 400th anniversary of Samuel de Champlain’s exploration of the lake that bears his name. VPR’s John Dillon has the first of two reports on Lake Champlain science and solutions.